Please Login Your Account | Forgot Password? Esico Soldering Pots are general purpose solder pots. They are designed for continuous production requirements. The cast iron crucibles are designed for operator convenience, comfort and high volum production. These Solder Pots are supplied with three conductor cordset. Model 12, 20 and 36 are designed for Dip Soldering of individual Wire Leads. Model 37 and 70 are designed for Dip Soldering and Tinning of larger Parts and when more heat is required. Model 75 and 80 are used extensively for short run soldering and desoldering of through hole printed circuit boards. 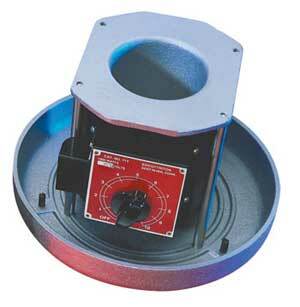 Model 71T is a large capacity solder pot with deep crucible for long parts. It is equipped with Thermostat temperature control and Dross Tray.